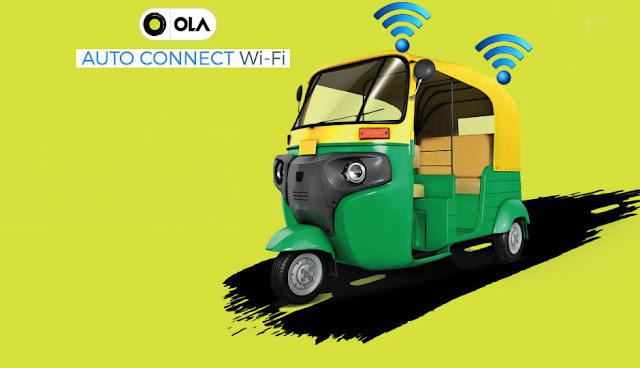 Ola on Monday announced to extend its complimentary “Auto-Connect Wifi” service to its Ola auto-rickshaw facility across 73 cities in the country.Wi-Fi connectivity for existing Ola customers begins as soon as the trip starts. First-time users need to connect via “one-time authentication” key on their phones. Siddharth Agrawal, Sr. Director & Category Head – Auto said, the company had already disrupted the transportation sector by bringing one of the most traditional means of commute online for computers and driver partners. With Auto-Connect Wifi, now it was reinventing the 3-wheelers and enabling a connected experience for our customers, a company release said here today. Ola started its auto service in 2014, and claims to now have over 1.2 lakh auto rickshaws (1,20,000 auto rickshaws) registered on its platform.The company earlier claimed over 200TB of data was being consumed by users of Ola Prime monthly. As of now, an Ola user consumes 20MB data on an average. Ola earlier expanded the Wi-Fi offering to other categories including Mini, Lux, and Micro.Ola has over 1,20,000 auto-rickshaws registered on its platform. The Ola app for auto driver partners is available in English and eight local languages.